Meaty, Beaty, Big And Bouncy! 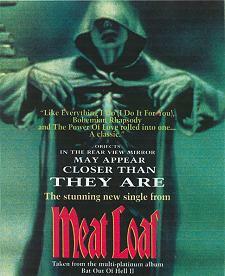 'Bat Out Of Hell,' Meat Loaf's epic debut album, is the fourth biggest selling album in history. But that ain't all. Mere sales figures, however spectacular, don't tell the whole story. 'Bat Out Of Hell' is Rock at its most extravagant and heroic. The sequel is another colossus. In the 15 years since the release of the original 'Bat Out Of Hell,' Meat Loaf, a mad man-mountain of a singer, has been down on his luck. 'Dead Ringer' was a sturdy follow-up, but successive albums sent Meat's career into steady decline. 'Bat Out Of Hell II' had to come. And only one man could write it: Jim Steinman, author of the original album. It's taken years but Steinman and Meat have done it. "If anything, the new record has got more of an epic feel to it than the original!" Meat told Kerrang! in July. Meat didn't lie. '...Back Into Hell' is an extraordinary achievement, unbelievably pompous and so totally Rock-tastic that Smashie and Nicey would be lost for words. Do Steinman's old-fashioned teen-dream rock 'n' roll fantasies matter in 1993? Perhaps not to Nirvana and Metallica fans, but there's an older generation of Rockers out there who will, quite properly, worship this album. Simply, '...Back Into Hell' will not be denied. It is a work of genius, a ready made Rock classic and arguably the last word in Rock operas. Steinman may be as mad as a goose on stilts, but he knows how to write an epic Rock song. 'I'd Do Anything For Love (But I Won't Do That),' 'Out Of The Frying Pan (And Into The Fire),' and - get this - 'Objects In The Rear View Mirror May Appear Closer Than They Are' are as grand as their titles. Steinman is the director, Meat is of course the star, with best supporting role going to Roy Bittan, pianist in Bruce Springsteen's E Street Band. And if '...Back Into Hell' was a movie, it would have to be 'Gone With the Wind'...meets 'Indiana Jones And The Last Crusade'...in 'Jurassic Park'.